I'm not quite sure why this chair decides to explode into pieces, but I have to admit it's rather impressive how it's able to pull itself back together! It's obvious that the video is edited and I'd really like to know how long it took from start to finish. Well done though... seems like their may be some military robots that could benefit from such technology, I'm sure that's already on the radar. "it is hard to properly evaluate the way people interact with computers since questioning them at the time is distracting and asking questions later may not produce reliable answers." Microsoft wants to employ electroencephalograms (EEGs) to read electrical signals within the brain and has devised a method "of filtering EEG data in such a way that it separates useful cognitive information from the not-so-useful non-cognitive stuff." Considering all of the potential things one could be doing with one's PC... they may not like what they see inside of every ones head! The Croucher Brewing Company in the central North Island city of Rotorua, New Zealand had a laptop stolen earlier this week. The machine apparently had the only up to date copies of label designs, contact details and financial information and the company is desperate for it's return. According to the companies website "... instead of sitting on our hands hoping against hope that it would be found, we decided to offer a reward… if someone finds the laptop and returns it with all files and data in-tact and as it was, we will supply that person with one dozen Croucher Brewing boutique beer every month for the rest of their life! That is not a typo." I like your thinking guys! And apparently so does the media "The amount of interest in our plea has been fantastic, and has allowed a devastating event to have a silver lining with the good wishes of people far and wide. Thank you." New Flickr interface with Geotagging! First Google Earth and now Flickr, seems like geotagging is the "in" thing in user interface on the web. Om Malik seems impressed by the Flickr move, which provides users with a map like view and pinpoints where photo's were snapped relative to the map. I agree it's a great tool for browsing, though I don't think it will ever replace searching. Again another new way to waste time on the Web. As a side, I've been planning a family trip to Disney and have been contemplating the purchase of a new camera. The decision process has been complicated by the fact that I can't decide on still or video... I realize that most stills take video and vice versa. One of the video cameras that I've been eying is the Sanyo Xacti and now Om has made the choice even more complicated. The video displayed in his post was created with the Xacti and is a bit grainy, the light is obviously dim and that would help explain it but it's got me questioning the quality. Then again if it's good enough for Om Malik... 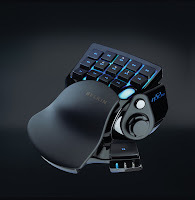 Anyone have any experience with the Xacti? I'd love to get your comments! The CBC has posted speculations that the Chinese government, upset by President Bush's awarding of the Dalai Lama with a Congressional Gold Medal, is hijacking traffic meant for Google and Yahoo and directing it to the Chinese-owned Baidu search engine. The Chinese government routinely censors internet content and blocks web pages but this move is seen as a retaliatory reaction to the US's support for a figure that the Chinese see as a threat. Can't we just all get along and play nice? Update: InfoWorld is reporting a contrary story saying "Internet users in Beijing and Shanghai said attempts to access Google and other search engines were successful Friday, despite claims on a U.S. blog that traffic to these sites was redirected to Chinese search engine Baidu.com." Thanks to boingboing for this link. An instructables contributor shows you how to create a spooky hologram illusion that will delight your trick or treaters! You even get to use your PC! Here is a really interesting story from ars technica. Researchers at Carnegie Mellon University, the International Computer Science Institute, and the University of California, San Diego are collaborating to disrupt the trade of malware and credit card information on black market web sites. Using economic theories the researchers are messing with the reputations of the traders and creating false identities to inject doubt into the market. It seems that those who trade in such commodities place as much stock in a black market traders reputation as you or I might in an eBay sellers reputation. Using this as a tool against the traders the researchers are injecting damaging misinformation about sellers into the markets and creating false identities so as to drop the trust levels and place doubt in the minds of the traders. I love it! It's kinda like stringing along those Nigerian scammers... well done. Scientists at Princeton University have created a new material from semiconductors that bends light in a direction opposite to the way it naturally does. I don't pretend to know anything about what these guys are doing here, but the thought of these so called metamaterials "raising the prospect that they might be used to create invisibility cloaks", is just cool! The CBC has more of the technical stuff here. Feeling the pressure of new rival Amazon, Apple has decided to drop the price of it's DRM-free music from $1.29 to $0.99, bringing it's prices in line with the competitors offering. In this Globe and Mail article an Apple spokeswoman is quoted as saying "It's been very popular with our customers and we're now making it available at an even more affordable price,". While they may deny that the move is motivated by competition, it's hard to ignore the fact that the music industry is in flux and with more competition and bands going it alone, it will be interesting to see what happens over the next little while. One of the last big holdouts, Led Zeppelin, said their back catalog, including "Communication Breakdown," "Whole Lotta Love" and "Stairway to Heaven," will be available from online music stores Nov. 13th. The two-CD retrospective, "Mothership," will be released the same day. It appears as though they are going digital in a big way, also signing a deal with Verizon Wireless to offer their songs as ringtones and downloads to mobile phones. Wired News story here. YouTube has created new tools to help clamp down on the posting of copyrighted materials without permission on the site. Dubbed "Video Identification", the tools "also give copyright owners the chance to leave their video on the service and to sell advertising around the content" according to this BBC article. Until now YouTube had no automated means of determining what is copyrighted and what is not, and relied on copyright owners to identify their works which would then be removed from the site. The new tools still rely on buy in from the owners, as they are required to provide copies of their works to be used for comparison by Video Identification, but at least it is a more proactive stance. YouTube is currently being sued by Viacom for allowing that companies copyrighted content to be viewed on the site. Proof now available, politicians are zombies! With titles like "Mindless Liberal Zombies Rise From The Grave!" and "Brainless Conservative Ghouls Attack! ", JibJab.com allowes you to put your face on a monster killing character and take on the ghastly political party of your choice in their latest "Starring You!" video production. If you are not politically charged, "you and four friends can-can do the Can-Can, and you will-will. Petticoats optional!" Share the fun, and laugh until you wet yourself! Britain will start the switch away from analogue television signals on Wednesday, when residents of Whitehaven are turned off. The process will take 4 years to complete with the entire country being digital by 2012, which will see the project completed just as Canada's switch over begins in the summer of 2011. Finland has lead the way completing its Digital implementation in August of this year. Governments are mandating the change because digital cable is a more efficient use of the broadcast airwaves, with several digital channels using the same transmission space as one analogue channel. Cable companies and television manufacturers are no doubt pleased with the change as well, as new equipment is required and higher premiums are involved. The CBC has more details here. The Globe and Mail is reporting about the intentions of the Internet Corporation for Assigned Names and Numbers (ICANN) to launch 11 test sites today in languages that don't use the Roman alphabet. "Until now, addresses on the World Wide Web used Roman alphabet-based suffixes – .com, .org or .net – even if the rest of the domain name appeared in a language such as Japanese, Russian or Arabic." The move makes sense for those in countries that don't use the Roman alphabet but is it a decision based on pure motives or is it a chance to sell more domain names? “If I don't do it, and somebody else does it, people will be misguided,” Vadim Sloutsky of torontovka.com, said. Failing to secure his domain name with Russian Cyrillic letters would open the door for squatters to set up a competing site that could leach traffic from his site. It's always been a bit like the wild west out there, looks like another gold rush might be looming. Another amazing YouTube video! I'm glad I don't do laundry for these guys! c|net's news.com has an interesting video of innovations in appliances and furnishings that are finding their way into the Japanese households. From space saving kitchen appliances to bedrooms designed to put you to sleep and gently wake you up, it's all ingeniously thought out. I can't wait to see these products hitting the North American market!